Swimming, my first love and probably my last one too. My parents would joke that I swam before I walked and that my shoulders were bigger than my dads at times. Yes those shoulders! Let me tell you! Being a teenage girl is not as easy but being a teenage girl with braces, bangs and huge swimmer shoulders is a real first-world-problem-disaster! Um and ladies: There is nothing better for your breast muscles than swimming, just as an fyi. Same goes for you boys! I was prepared to give you straight up facts about swimming but my coach Laura did such an amazing job answering all my questions, that this is totally unnecessary! Laura swam in high school (Elmhurst, IL) and joined a masters team in 1993 when she started competing in triathlons. She started coaching the masters team she swims with in 2001 and was appointed Head Coach in 2012. She has her USMS Level 4 Coaching Certification and is the recipient of the 2012 USMS Kerry O’Brien Coaching Award. In addition, she also coaches at Google, and for the Silicon Valley Triathlon Club. She is a Certified Spin Instructor and a Level 2 TRX Trainer and has a B.S. Degree in Health Science. AND Laura has by far the most toned arms I’ve ever seen in my life! What do you like about swimming? ⇒ I love swimming because it’s a non-impact exercise but the cardiovascular and muscular benefits of swimming are amazing. ⇒ It’s challenging. I am constantly working on ways to improve my stroke, watching the pace clock and getting my times during my workouts. ⇒ Some people say they get bored – I rarely get bored because I am always thinking about what I am doing with my stroke, breath, kick, and speed. ⇒ Toys! Fins, paddles, buoys, kickboards add variety and help with strength. Kicking with fins is a great leg workout! ⇒ I never regret a swim workout. Sometimes I will come up with excuses why NOT to swim but I then I remind myself that I am always happier when I actually go. I can swim but I am no pro, is it worth taking swim lessons as an adult? Absolutely! 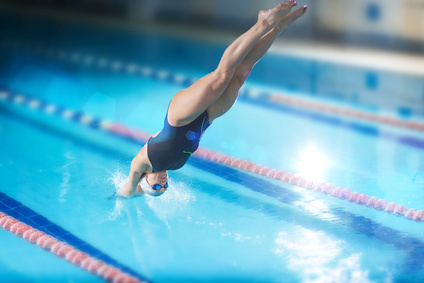 Since swimming is a non-impact exercise it is one of the few workouts you can do without worrying about the wear and tear of your knees and back. Swimming is also great if you want to cross train – if you are training for a marathon or long bike ride, your cardiovascular endurance and lung capacity will improve greatly if you swim. In addition, and most importantly, there are more than 18 million swimming pools and hot tubs in the USA. Yet, according to the Centers for Disease Control, 37% of American adults cannot swim the length of a pool. Every day, about 10 people die from drowning. The majority of unintentional drowning victims are adults. Drowning ranks fifth among the leading causes of unintentional injury death in the United States. The CDC identifies a variety of factors that can influence drowning risk, including the lack of swimming ability. In short, learning to swim can save your or your children’s life! ⇒ Swimming recruits all the major muscle groups, including the shoulders, back, abdominals, legs, hips, and glutes. And because water affords 12 times the resistance as air in every direction, it really helps to build strength. ⇒ It’s cardiovascular and strengthening at the same time, and not many workouts have that. ⇒ Swimming offers something no other aerobic exercise does: the ability to work your body without harsh impact to your skeletal system. When the human body is submerged in water, it automatically becomes lighter. When immersed to the waist, your body bears just 50 percent of its weight; dunk yourself to the chest and that number reduces to around 25 to 35 percent; with water all the way to the neck, you only have to bear 10 percent of your own weight. The other 90 percent is handled by the pool. What is different compared to other workouts? ⇒ You can swim anytime – rain or shine. The temperature in a pool is between 78-81 degrees. It’s warmer than the air so when people say “it’s too cold” I ask them to remember – the water in the pool is warmer than the air outside most days! 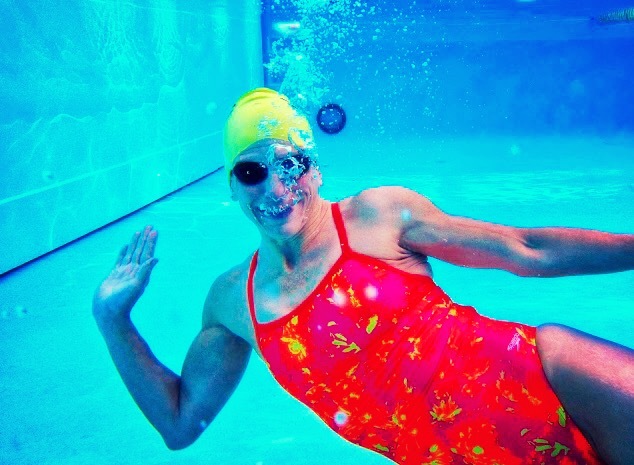 ⇒ Swimming recruits all of the major muscle groups – including the shoulders, back, abdominals, legs, hips, and glutes. And because water affords 12 times the resistance as air in every direction, it really helps to build strength. ⇒ The types and variety of workouts you can do are endless. 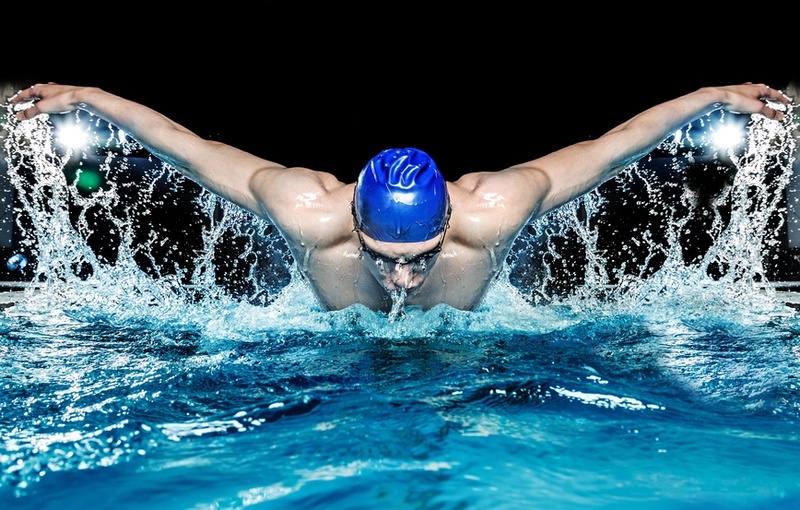 You can swim various distances, speeds, and incorporate equipment into the workouts to prevent boredom and to improve technique. What is your favorite stroke and which one do you think is the most effective one? My favorite stroke is butterfly. It’s very challenging and requires a lot of flexibility and shoulder strength. The dolphin kick is also a great ab workout! On the flipside it’s also the hardest stroke to teach someone. Being efficient in all strokes will greatly benefit your freestyle stroke. It’s like going to the gym and doing different exercises to develop leg strength. You will incorporate various exercises to develop that strength. Changing up the routine is also good for the body. If someone is training for a triathlon or open water swim, I teach them breaststroke – I call it the “panic button” stroke. If you are out in the water and get tired or panic, switch to breaststroke. It allows you to relax, breathe more, and get your bearings on where you are. How many times per week should I train in order to see progress? Minimum two days a week, ideal would be three to four times a week. Most people who really want to improve their swimming don’t swim enough. I coach triathletes and their swim workouts are the lowest priority. But then they come to me and ask me “why am I not getting any faster?” If you are only swimming once a week you won’t see much improvement. I recommend swimming three times a week (two times minimum) if you really want to get fit, comfortable, and efficient. The beauty of swimming is you could swim everyday because you can change up the workouts. You can swim, kick, pull, or just work on drills. It’s just like taking different routes on your weekly bike rides! How many calories do I burn during a 45 minute class? There are many variables to determining the number of calories you burn while swimming: gender, height, weight, how far and how fast you swim in 45 minutes. I would say after doing some research you can burn anywhere between 300-700 calories in 45 minutes (or more depending on how far you can swim in those 45 minutes). How much is cardio and how much is strength? I would almost say 50/50. Swimming will strengthen your heart (remember, the heart is the most important muscle in the body!) Swimming will also increase your lung capacity which in turn will improve your cardiovascular endurance. When strokes are performed correctly, they work all the major muscles in your body by lengthening them and increasing their flexibility. Over time, this builds muscular endurance. As you kick and pull, you engage your arms, shoulders, upper back and leg muscles. Your core engages to keep you stable and moving forward, strengthening your hip, lower back and abdominal muscles. How does a swimmer really train? Some folks are happy just to get in the pool and swim laps over and over again. I like to encourage swimmers to monitor their ability and progress. You can swim on your own and find workouts on-line or you can join a group that is led by a coach. The coach will give you a workout that will target specific cardiovascular systems and upcoming events such as a swim meet, open water swim or triathlon. My workouts will vary by day and can include an anaerobic threshold set, a low heart rate long distance set, or a short, fast, sprint set. If we are getting ready for a swim meet we will write sets that target the events in the meet. There are lane etiquette guidelines and are usually posted at the pool or you can find them on-line. It is always a good idea to check with the facility and swimmers on what the plan is before you hop in. If you are swimming a coached workout you would be in a lane with swimmers of the same ability. If you are lap swimming you would typically try to swim with folks who are the same speed. A lot of pools will designate the lanes by “fast swimmers,” “medium speed,” and “slow.” Etiquette includes things like circle swimming versus splitting a lane, which side of the wall to stop on, etc. Thank you so much Laura for answering all these swim related questions! In case you were wondering, I grew into my shoulders by now. Stay happy, strong and wonderful! Je ne suis pas d’humeur à écouter de la musique gaie après les incidents cette semaine. C’est pour ça que je vais partager ma chanson française préférée de “Stromae.” J’espère que c’est OK qu’il n’est pas français. 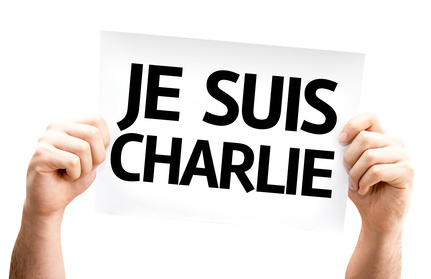 Because of this weeks horrible happenings I am going to share my favorite song in french! Schwimmen ist meine erste Liebe und wird wohl auch meine Letzte sein. Meine Eltern witzelten regelmäßig, dass ich schwamm bevor ich gehen konnte und meine Schultern kräftiger waren als die meines Vaters . Und Ladies: Es gibt kein besseres Training für Eure Brustmuskulatur! Das Gleiche gilt für die Boys natürlich auch! Laura ist mein Coach und schwamm bereits zu ihrer Schulzeit. 1993 trat sie einem professionellen Triathlon-Team bei, 2001 begann sie das professionelle Team selbst zu coachen und 2012 wurde sie dann Cheftrainer. Sie besitzt die USMS Level 4 Trainer-Zulassung und wurde 2012 mit dem USMS Kerry O’Brien Preis ausgezeichnet. Zusätzlich trainiert sie Leute bei Google, dem Silicon Valley Triathlon Klub, ist ein Spin-Instruktor, hat ein Level 2 TRX Trainer Diplom und hat ein Bachelor in Gesundheitswissenschaften. Und sie hat mit Abstand die stärksten Oberarme welche ich jemals gesehen habe! Was magst Du am Schwimmen? ⇒ Ich mag, dass es ein Sport mit Niedrigauswirkung auf den Körper ist, aber trotzdem unglaublich kardiovaskuläre -und muskuläre Vorteile mit sich bringt. ⇒ Es ist herausfordernd! Ich arbeite konstant an meinem Schwimmstil, kontrolliere mein Tempo und stoppe die Zeit. ⇒ Manche Leute sagen sie langweilen sich während dem Schwimmen. Nicht ich! Ich denke immer and meinen Stil, Atem, Kick, oder an meine Geschwindigkeit. ⇒ Spielzeuge! Flossen, Paddel, Bojen, Kickboards! Vielfalt beim Training hilft dem Spassfaktor und Deiner Stärke! ⇒ Ich bereue NIE ein Schwimmtraining! Manchmal suche ich nach Entschuldigungen weshalb ich nicht trainieren sollte, aber dann erinnere ich mich, dass ich immer glücklicher bin, wenn ich tatsächlich trainiert habe! Ich kann schwimmen, bin aber nicht sehr gut darin. Sollte ich Schwimm-Lektionen nehmen um meinen Schwimmstil zu verbessern? Mit Sicherheit! Da Schwimmen schonend für Deinen Körper ist, kann es auch noch bis ins hohe Alter ausgeübt werden. Schwimmen hilft auch wenn Du für etwas spezielles wie einen Marathon trainieren möchtest. Es sollte Dir nicht peinlich sein, falls Du nicht ein toller Schwimmer bist. Wie mit Allem muss man es zuerst lernen, auch im Erwachsenenalter. Es ist wichtig den richtigen Schwimmstil zu schwimmen um optimal von diesem Sport profitieren zu können. Was sind die Vorteile des Schwimmens? ⇒ Durch das Schwimmen werden alle wichtigen Muskelgruppen trainiert. Da Wasser 12 mal mehr Resistenz hat gegenüber Luft, hilft es unglaublich einen starken Körper zu bilden. ⇒ Es ist Cardio und Kraft gleichzeitig! Nicht viele Workouts bieten dies. ⇒ Schwimmen ist schonend für Deinen Körper. Da Dein Gewicht im Wasser nur 50% beträgt, ist es speziell für Übergewichtige Personen geeignet. ⇒ Schwimmen ist speziell gut für Leute mit Gelenkbeschwerden, oder anderen Gebrechen. Was ist beim Schwimmen anders als bei anderen Workouts? ⇒ Du kannst zu jederzeit und bei jedem Wetter schwimmen. ⇒ Schwimmen trainiert alle grossen Muskelgruppen gleichzeitig. ⇒ Es gibt unzählige Schwimmstile, Spielzeuge, Du kannst verschiedene Zeiten schwimmen, verschiedene Längen anstreben, langweilig sollte Dir gewiss nicht werden. Was ist Dein liebster Schwimmstil und welcher denkst Du, ist der effektivste? Mein liebster Schwimmstil ist der Butterfly. Dieser ist sehr herausfordernd und verlangt nach viel Flexibilität und Schultermuskulatur. Wenn ich jemanden für einen Triathlon vorbereite, lerne ich auch immer das Brustschwimmen. Ich nennen es den “Panikknopf.” Falls Du mal im Wasser Panik kriegst, müde wirst, oder Atemnot kriegst, wechsle zum Brustschwimmen. Dies bietet Dir die Möglichkeit zu relaxen und regelmäßig zu atmen. Wieviel Mal pro Woche sollte ich schwimmen um einen Unterschied zu sehen? Minimum zwei Mal pro Woche, besser aber drei, oder vier. Die meisten Leute wundern sich, dass sie nicht schneller werden. Auch bei Triathleten ist das Schwimmen die unterste Priorität, aber um besser zu werden, ist es wichtig drei (minimum zwei) Mal pro Woche zu trainieren. Wieviele Kalorien verbrenne ich in 45 Minuten? Dies kommt auf Deinen Körper an, aber in etwa zwischen 300-700 Kalorien. Benutze eine Pulsuhr, oder Kalorien-Rechner um Deine genaue Zahl zu kennen. Wieviel ist Cardio und wieviel ist Kraft Training? Ich würde sagen in etwa 50/50. Vergiss aber nicht, dass das Herz Dein wichtigster Muskel ist, auch wenn man den nicht sieht. Zusätzlich wird auch Deine Lungenkapazität verbessert. Wie trainiert ein Schwimmer wirklich? Manche ziehen es vor ihre Längen zu ziehen, aber ich als Coach ziehe es vor, abwechselnde Stile zu schwimmen. Dein Coach wird ein Training auf Dich zuschneiden, damit Dein Körper optimal profitieren kann. Versuch in einer Länge zu schwimmen, mit gleich starken Schwimmern wie Du es bist. Sei nicht schüchtern zu fragen, erfahrene Schwimmer werden Dir gerne weiterhelfen. Es gibt auch Regeln ob die Länge geteilt, oder ob Kreise geschwommen werden. An welcher Seite man anhält usw. Vielen Dank für Dein Interview Laura! Bleibe stark, gesund und wunderbar! Je ne suis pas d’humeur à écouter de la musique gaie après les incidents cette semaine. C’est pour ça que je vais partager ma chanson française préférée de «Stromae.» J’espère que c’est OK qu’il n’est pas français.